Thanks (again) to June for helping me out a bit. This was by far the SMALLEST crochet hook/thread I have ever used. 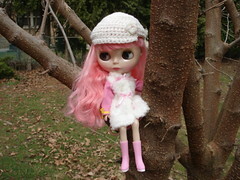 After finishing the dress, I switched off to some worsted weight yarn and crocheted a hat for Blythe as well. Let me tell you, that hook and yarn felt JUMBO compared to what I used for the dress. They were both super fun to make! small? how about uber teesny tiny crochet! Kudos to you for being able to crochet that small. I get all irritated and have to reach for a margarita to dull the pain in my head! LOL! Very cute stuff. I love both the dress and hat. Very nice – I tried thread crochet, but I needed something alot stronger than a margarita to dull the pain. I’ll stick with my regular yarn… dont want to rush the gray hairs, lol. Great job! Very cute. I love thread crochet. jbirren – All I can say is SUBMIT! You know you want to! They are so darling and it is so fun to make stuff for them! 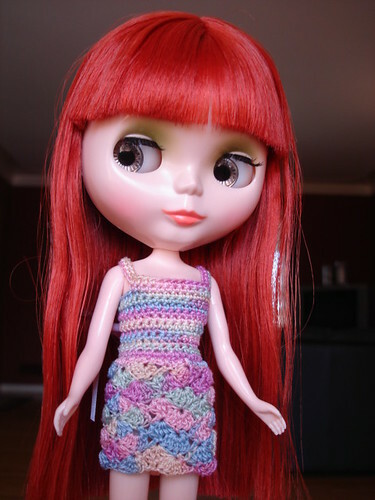 I had ordered my second Blythe doll before the first even arrived. There are ENDLESS amounts of crafting fun you can do with your Blythe.